One of the great unrecognised talents of British comedy just died, the… the… there’s no adjective sufficient to describe Linda Smith. Little brother Dov pointed her death out to me and I had a little cry. She was 48, and she only really achieved any proper success in the three years she knew she had cancer. 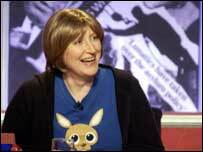 “She was recently voted The Wittiest Living Person by listeners to Radio 4’s Word Of Mouth.” Very sad. Listen to the tribute News Quiz on friday at 6.30 on Radio 4.